Andrey Zvyagintsev, whose film is Russia's official entry for the Oscars, answers questions about cinema, modern society and film distribution. The film Leviathan by Russian film director Andrey Zvyagintsev received the award for Best Script at this year’s Cannes Film Festival, has been submitted for an Oscar nomination and was recently named the best film at the BFI London Film Festival. 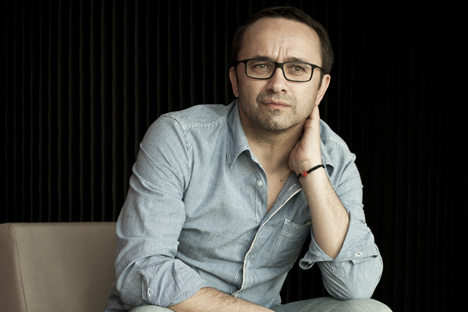 In an interview with RIR, Zvyagintsev discusses the selection of his film as Russia’s Oscar submission, the relationship between spirituality and the rule of law, and what an ideal state should strive for. RIR: Your film is based on the story of Marvin Heemeyer and his struggle against the state machine. What got you interested in the American’s story and why did you decide to move it to a Russian setting? Andrey Zvyagintsev: Marvin John Heemeyer had a muffler shop standing on a plot of land that a cement plant wanted to buy from him. Marvin refused a deal and the cement plant built a fence around his property, blocking access to it. Having despaired, Marvin then took a bulldozer, drove it through the plant and several other buildings and then killed himself [Heemeyer had modified the bulldozer by adding armor-plating – RIR]. When I heard this story in 2008, I was amazed that it should have taken place in the U.S. A revolt against injustice perpetrated by the authorities, lawlessness that the man came up against – how could all that be possible in the United States, which is considered to be governed by the rule of law and where anyone can prove they are right by seeking justice in a court of law? Does it mean that not all is quite so fine there? That prompted me to think that the state is more or less the same everywhere and that lawlessness, to this or that degree, exists everywhere. It is a banal, simple thought but it struck me. Recently I came across a wonderful question in St Augustine’s The City of God: how is the state different from a gang of thieves? Both are a community of people. Both are run by a leader. Both have an established and agreed system of relations. The only thing that sets them apart is the presence of the law. Thus, if a state loses the rule of law, it turns into a gang of thieves. If a person can always expect to get protection in a court of law; if the law applies to everyone irrespective of their rank and title and everyone is equal in front of the law, then this is an ideal form of the state. That thought convinced me that in his treatise Leviathan, Thomas Hobbes was fundamentally mistaken to idealize the state. An ideal model can be created on paper, however the minute a human being, with all their vices and faults, comes on stage, any ideal will easily turn into its opposite. It is no longer a social contract but a contract with the Devil. A contract under which a person gives up their freedoms in exchange for bogus social protection. RIR: What is your take on the debate that is now gaining currency about the alleged lack of spirituality in the West as opposed to Russian spirituality? A.Z. : It would be easier to speak of spirituality if our country were truly governed by the rule of law. Spirituality is a metaphysical concept and it could be used to think up anything and to justify anything. Thus, we are back again to the idea of a state governed by the rule of law. When a person is protected, they are sound in body and in mind, they feel different. Whereas, when one has to constantly think of self-defense when going out into the street because they know that the police will not protect them, there can be no talk of a sound mind and spirit. RIR: By selecting Leviathan, the Russian Oscar committee appears to have changed its tactics: Previously it tended to give preference to large-scale, epic movies, whereas now it has opted for a low-key social drama. Why, do you think? A.Z. : I am, of course, an interested party here, but – if looked at from a detached position – it was a breakthrough: The establishment lost that round. The eternal and omnipotent Russian cronyism suddenly suffered a glitch. There are two reasons for this: The serious and responsible attitude of Leviathan producer Alexander Rodnyansky, who did everything so that as many members of the commission saw it on as big a screen as possible. And the other reason is that the Oscar committee has considerably expanded its membership. It now has fewer partisan figures and more people who are less dependent on the establishment. The commission now has more members who are free and are capable of voicing independent opinions. RIR: You make films that do not seek box-office success or a mass audience. And yet your complex, intelligent films, which have all the hallmarks of an art-house offering, manage to captivate a mass audience. Where are your films better received: in Russia or abroad? A.Z. : There are some 40,000 cinema screens in the United States, about 400 of which specialize in intellectual, art-house movies. The Film Forum movie theater in New York was running Renoir’s La Grande Illusion and my Elena at the same time. I was very proud of that juxtaposition. There are too few screens in this country, there is no system of specialized screens for showing intellectual, art-house films. There is practically no well-developed, forward-looking film distribution industry. It would therefore be unfair to accuse the audience of losing its interest in art-house cinema. When Elena was shown on TV, it turned out to be of interest to a mass audience and had a very high rating. It is just that grown-ups have practically stopped going to the cinema these days; cinema audiences are becoming younger, and what teenagers want is a rollercoaster of a movie. Having said that, I truly believe that Leviathan is being eagerly awaited by people of various generations and they will come to see it.